Basketball season is upon us, for those NHSOA members who didn’t attend a summer clinic we have exciting news. The NHSOA board of directors voted to purchase HUDL. HUDL will be a great tool for officials to self evaluate and use to get better. During the fall sports season we did a trial period with things going pretty smooth. Our goal is to have HUDL access for all NHSOA members for the Winter sports season. We have some administrative questions/concerns to iron out and we will be good-to-go, hopefully by our November 22nd meeting we can move forward. Our summer clinics were well attended. 169 officials attend clinics throughout the State, District 1 @ Northstar, District 2 @ Creighton Prep, District 3 @ Central Community College Columbus, District 4 @ GICC, District 5 @ McCook Community College, and District 6 @ Scottsbluff High School. Out of the 169 officials over 40 had less than 5 years experience. It was great to see new officials attending the clinics; it was also great to see the veteran officials helping these officials. I would like to thank our NSAA observers who served as clinicians, Jeff Wolf, Rich Rethwisch, Larry Bornschlegl, Vince Smith, Carlos Flores, and Willie Wisebrook. Thank you to the NHSOA basketball committee members in each district for the time spent and commitment to put the clinics together. Remember NHSOA members, this is your association, and without you the NHSOA would not exist. If you have any concerns/comments feel free to contact myself or a committee member in your district. Have a great season. Officials please take a chance to help a younger official out this year. One goal of the NHSOA is to help younger officials get started and get down the right path. Do not be afraid to take a beginner to a game with you so they can sit in on your pre-game, watch you work, and sit in on a post-game. We challenge you to help others get better. Please make sure that your crew goes through a pre-game. This can and will eliminate problems or circumstances that may arise in the game. The pre-game is especially important before the first game of the season since everyone involved, your crew, coaches and the teams you are officiating, are all participating in something that they haven’t done in a while. Communication amongst your crew is a must along with coaches, players and site personnel. There is a pre-game sheet on the NHSOA and NSAA website that can be downloaded for you and your crew. Professionalism is needed from the time you walk on the court until the time you leave after the clock has expired. The biggest challenge officials have is to maintain focus for the entire game. If needed, during timeouts get together and talk (make sure it is something big enough at the time). Conducting a post-game is also very important. It is a perfect time to evaluate yourself and your crewmembers. For example crews can breakdown situations that arose during the game. Face it, we will make some mistakes on the court, but by mentally preparing yourself with a pre and post-game we can eliminate a lot of mistakes. We all want to become better officials, and by challenging yourself each night you work to try to improve on one part of your game you can accomplish this goal! All sleeves/tights shall be the same solid color and must be the same color as and headband or wristband worn. Headbands and wristbands shall be white, black, beige or the predominant color of the jersey, and shall be the same color for each item and all participants. They must be the same color as any sleeves/tights worn. Closed book test will run from December 9th-14th. Post-season applications are due by December 16th. 4. NFHS Signals and Mechanics- Notice all the observers point out how important the use of mechanics are in our game. They help officials, coaches, and others in aspects of our game. Work on getting into shape both physically and mentally. We as officials owe it to the student-athletes and coaches to give them our best effort every time we step on the court. Develop or use a pre-game for you to go over before every game. A good pre-game could eliminate problems and prepare you for events during the game. Be professional from the time you arrive at the gym to the time you leave the gym. Get in front of a mirror and look at your signals, are they crisp and sharp? Also use only NFHS signals. Own your primary and trust your partners. Communication= within crew, with coaches, with players, with table. Hard to believe I have been a part of evaluating Nebraska High School basketball officials for five years. As we all say to each other, “where does the time go?” Every year we look forward to starting a new year and then, bang it is over. One year then runs into the next. This year see if you can do something better than I ever did. Be prepared! I was always in pretty decent physical shape, but as I review the career, I feel I could and should have been better mentally at the start. After all, the first game is as important to those players as the last. With that said, I am going to share a few points from each category of game management, clock management, play-calling, positioning, officiating with a plan, and mental approach. As the year goes and I am asked to be a guest writer we can add more. 1. If someone breaks your concentration, address it immediately. 2. Overt reactions to you as an official cannot be ignored. 3. Be consistent with Respect for the Game. 1. Know the clock and know its status EVERY possession. 2. ALWAYS have an opinion on clock plays – this will separate you. 3. Every time you cross a line on the floor, sneak a peek. 1. I am never going to blow out of primary with a closed look (Trust your partner). 2. When I blow in secondary coverage area, it will be a STRIKE with an OPEN look. 3. Low secondary whistle counts equals high total accuracy. 1. If you cannot see it, you do not guess, so do not blow the whistle. 2. Officiate where your partner cannot. 3. There is no magic spot to obtaining an open look, but always maintain an open look. 1. Relax – Trust your training. you noticed they are a point of emphasis. 3. Officiate forward – get to the next play! 4. Enjoy it – it will soon be over – trust me! Hope this gives you something to ponder. I really encourage you to take one thing each game you officiate and better yourself. Remember to communicate and see if you can figure out ways to save technical fouls and ejections instead of reacting quickly, then, later, wishing you had simply paused and reviewed in your mind. As I travel around with my legal pad and clipboard watching basketball games and observing officials, invariably I am asked by fans, “What are you doing?” followed by “What do you look for in observing officials?” In most cases fans are very supportive of the efforts put forward to assist officials in Nebraska. Several weeks ago I was observing a set of officials at a small school in central Nebraska. Needless to say, the fans around me were quite vocal and seemed to know all the rules of the game and what calls should have been made for the home team. Have you ever heard the officials in the stands….Get ‘em off their backs, 3 seconds, call ‘em at both ends. It was tough to keep my mouth shut but I succeeded through the first half. At half-time one of the most verbal fans asked me what I was looking for when I was taking notes. In a businesslike manner I told him that I was a representative of the NSAA with the expressed duties of observing high school basketball officials and evaluating the behaviors of basketball fans. The word got out and the officials in the stands were much more subdued the second half. I got a kick out of that. What do I look for when observing officials? The answer to this question is simple. I’m looking for what our officials are doing correctly and believe me, you guys and gals in the field have a good understanding of the game and are working hard to improve. Observers in the field want to make their visits a positive one for you and offer suggestions for improvement, if needed. Of course judgment and making calls are important but observers are not there to question your calls. They are there to make sure that officials are making calls while in the right position to make these calls. Officials must be giving their best efforts during every game. There is no room in our ranks for those who don’t give their all. Let’s review some of the positions on the floor and what observers are looking for. Lead Official: Does the lead look over his/her shoulder in arriving at the baseline, is the corner squared and does the official stay wide of the lane area to avoid being blocked out? Is off ball coverage given? Is the official a ball watcher? Trail Official: Does the official drop down to the free throw line extended when the ball goes to the corner opposite the official’s position (2 man mechanic)? Is there speed to lead in a quick transition? Is movement such that the official can look through action and not stand behind the play? Is the official releasing too early on field goal attempts? Does the official move onto the floor toward the action in back court and mid court areas. Center Official: Does the official focus on their primary coverage area? Does the official help on weak side post play and stay with shooters? Fouls and Violations: Are calls made consistently from beginning to end? Do players know what will be allowed? Good officials use good judgment in determining what is a foul and what is incidental contact and call it the same from beginning to end. Signals and Mechanics: This is a very comprehensive area due to the fact there are so many signals and movements. Some of the areas of “Look fors” are: At the point of the foul, does the official get the fist up high, hold position in giving a preliminary foul signal, verbalizing the jersey color and number BEFORE moving to the table to clearly signal and report the foul? Often we some NBA calls in our high school gyms. Be sure to use only approved signals. Are you in proper positions during time outs and at quarters? Where are you located during free throws…are you taking a slide step toward the baseline as the center and trail officials? Are you 3-4 feet from the lane as the lead? Is it easier not to switch after each foul call? Six feet is quite a distance, is the visible count being used? Is that an official on the floor or is it a traffic cop stopping the play with one hand and pointing directions with the other? This list could go on and on. A few other things that are observed include appearance and professionalism, relationship with players and coaches as well as the physical condition of officials. Personally, I like to see officials carry themselves proudly and exude confidence. Pregame duties include time of arrival, observational positioning, pregame meetings, and checking the book. 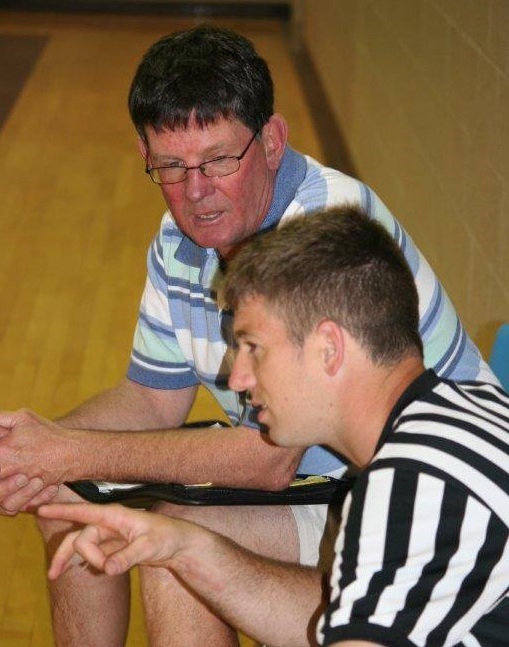 Officiating basketball is an extremely difficult and complex avocation for most of us, but extremely rewarding. Hopefully now you have a little better idea of “What we’re looking for.” Believe me, observers have walked…and run in your shoes and they want to support your efforts to improve basketball officiating in our state.